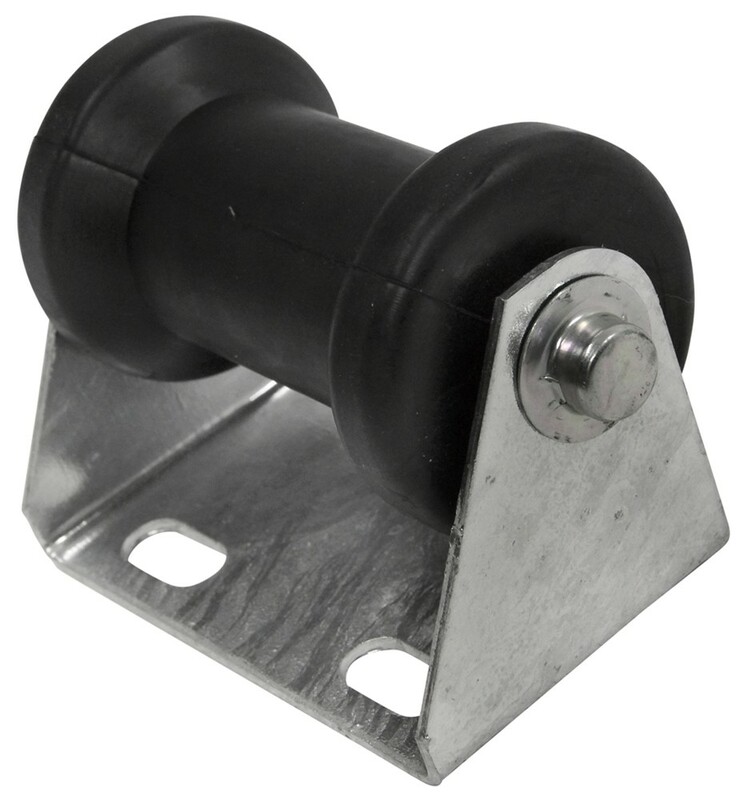 This roller assembly supports your boat's keel for easy loading and safe transport on your trailer. It features a 5-inch, black rubber spool roller and a galvanized steel bracket that attaches to your trailer's tongue. Call 800-298-8924 to order CE Smith boat trailer parts part number CE32150G or order online at etrailer.com. Free expert support on all CE Smith products. 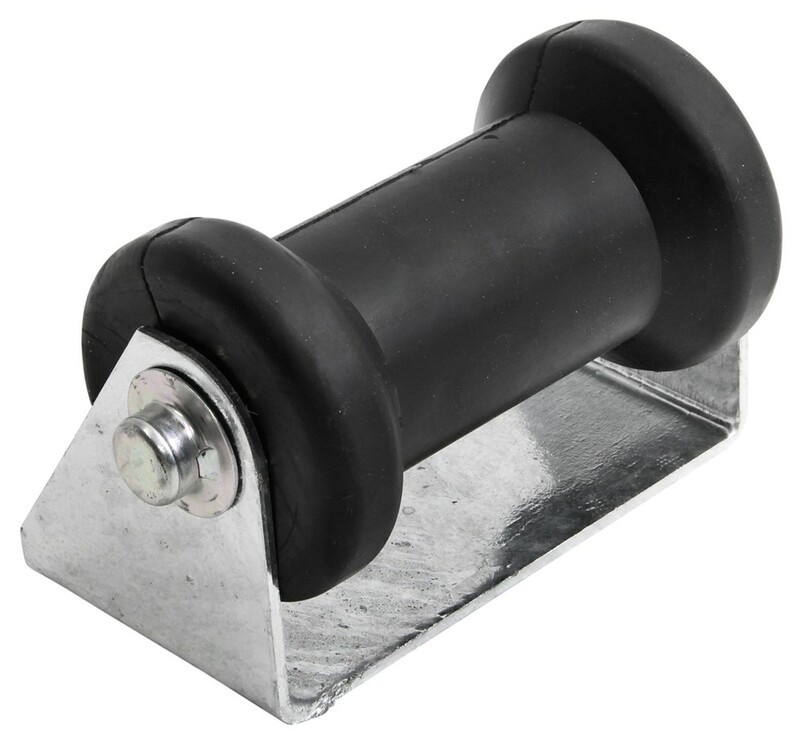 Guaranteed Lowest Price and Fastest Shipping for CE Smith Offset Spool Roller Assembly for Boat Trailers - Galvanized Steel w/ Black Rubber - 5". Boat Trailer Parts reviews from real customers. Diameter of mounting holes (each): 1/2"
This roller assembly supports your boat's keel for easy loading and safe transport on your trailer. 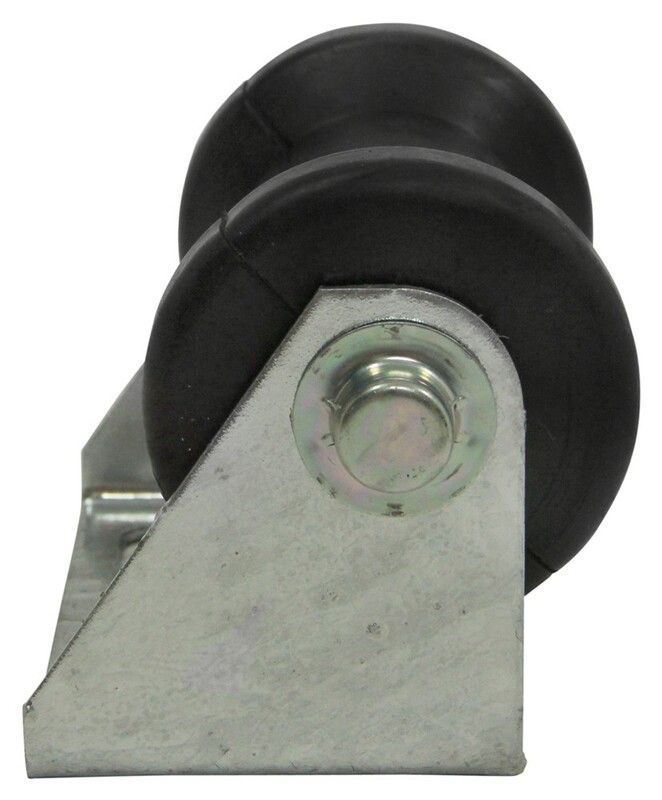 It features a 4-inch, black rubber spool roller and a galvanized steel bracket that attaches to your trailer's tongue. Replace your bow roller assembly with this complete kit. Includes a 4" roller, 2 end bells, and corrosion-resistant hardware. 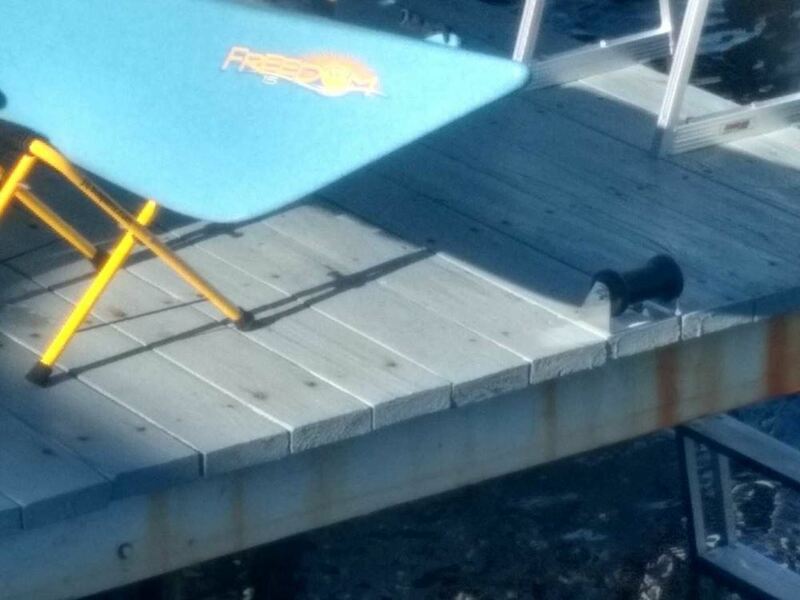 Blue TPR material is stronger than rubber and softer than polyurethane, and it won't leave marks on your boat. Video of CE Smith Offset Spool Roller Assembly for Boat Trailers - Galvanized Steel w/ Black Rubber - 5"
Today were going to review part number CE32150G. This is the CE Smith offset spool roller assembly for boat trailers. This roller assembly will help support your boats keel for easy loading and transport on your trailer. It features a five inch black rubber spool rubber and a galvanized steel bracket that attaches to your trailers tongue. 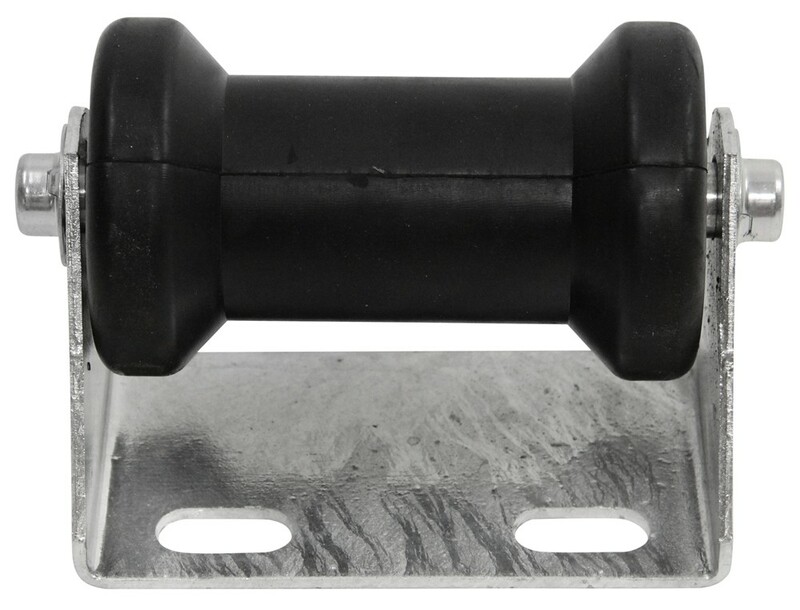 This part is typically installed flat on the tongue of the boat trailer and this spool roller bracket assembly stabilizes the keel of the boat during transporting. 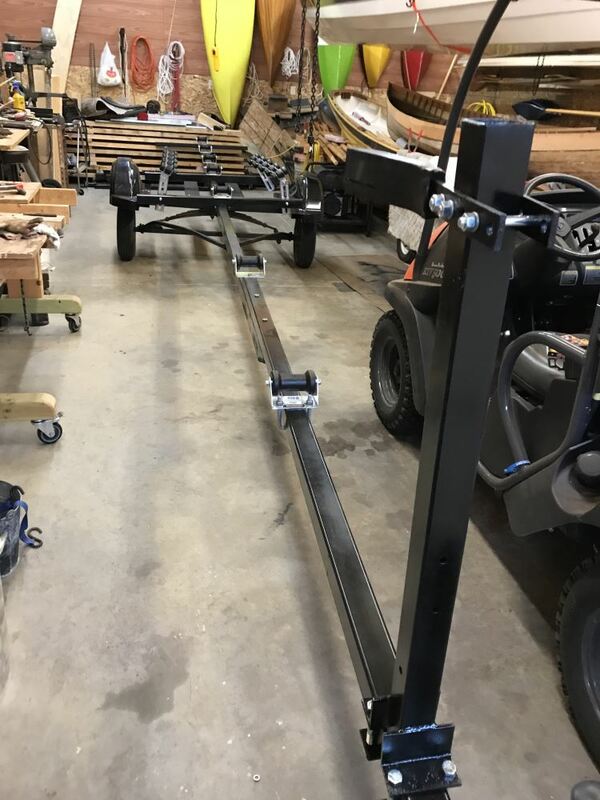 The roller will also support your boats keel as it sits on the trailer, prevents the bow of your boat from making contact with your wench, eases the loading and the unloading of the boat, and it also helps absorb road shock while the boats being trailered. 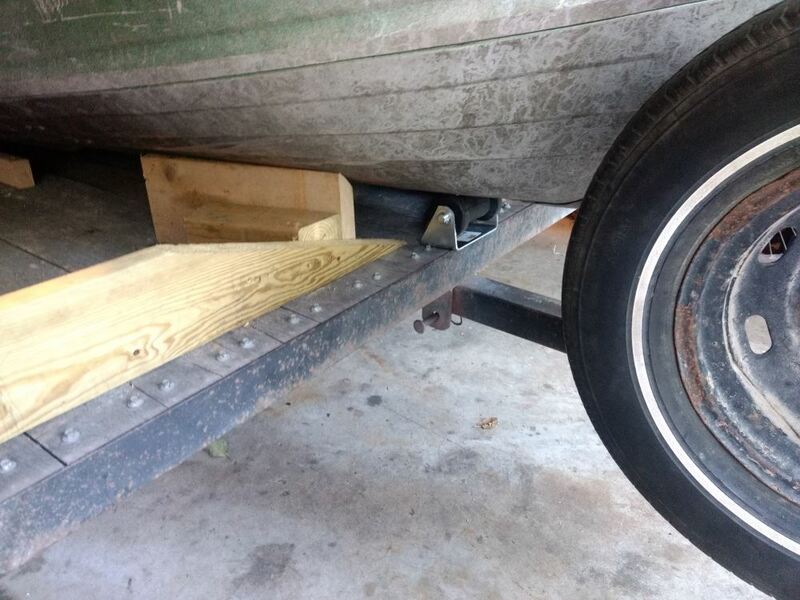 The bracket lets you bolt your roller assembly onto the tongue or frame of your boat trailer. The offset face, in other words from where you bolt it here to where the actual roller is, offers extra support. To install this it does require seven sixteenths inch fasteners which are not included. This is a black rubber roller which will delivery long lasting performance. The galvanized steel bracket is built of sturdy one eighths inch thick galvanized steel which will resist corrosion. The galvanized steel parts on this are hot dipped in a zinc plating after they are stamped. This will create a coating which is typically three millimeters to five millimeters thick. This thick coating will allow the galvanized part of the steel protects it and provides years of use without rusting or corroding. Give you a few dimensions on it. The roller length again is five inches. The shaft right here that it rides on is five eighths of an inch in diameter. The mounting holes which are down here are one inch long. They are half an inch wide. The spacing from center to center on these mounting holes is three inches. Just to give you the size overall of the bracket is five inches by three inches. This part is made in the USA. That should do it for review on part number CE32150G. Order: RelevanceNewestRating - High to LowRating - Low to High This roller assembly supports your boat's keel for easy loading and safe transport on your trailer. It features a 5-inch, black rubber spool roller and a galvanized steel bracket that attaches to your trailer's tongue. The CE Smith U-bolt # CE15253A could be used to mount the CE Smith Offset Spool # CE32150G. The diameter of the u-bolt and the mounting bracket of the offset spool are both 7/16 inch, and are compatible. I have included a video demonstration of the CE Smith Offset Spool for your reference. How Tall is the CE Smith Offset Spool Roller Assembly, # CE32150G. I went out to the warehouse and pulled a Offset Spool Roller Assembly, # CE32150G. Measuring from the bottom of the base to the top of the roller in the center section it is 3-3/8 inches. From the bottom of the base to the taller part at either end is 3-7/8 inches. I made a picture showing these dimensions. I pulled a CE Smith Offset Spool Roller Assembly # CE32150G that you referenced to measure the mounting holes and found that it measures 4-1/16 inches from the end of one slotted mounting hole to the end of the other. You should have no problem using mounting holes that are 3-1/2 inches apart. Check out the video I attached if you want to see me measure the distance between the mounting holes. I went out to the warehouse and pulled spool roller assembly # CE10400G to measure the inside width for you. The inside width is 1-3/4 inches so it will not work for you. Instead you will need a 5 inch assembly such as # CE32150G or # CE10451G. Please note that the rollers are not tested for use with a winch so I can't say whether or not it would work for that application. 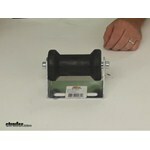 We have the part # CE32150G which is a 5 inch spool roller assembly in black rubber. The bracket is not slotted like the part # CE10451G though. Generally speaking the yellow non-marking thermoplastic is preferred to the black rubber as it won't mark up the boat at all. The CE Smith Offset Spool Roller Assembly, # CE32150G, does not have a replacement roller available for the unit. If the roller becomes worn out or damaged, the whole assembly will need to be replaced. For the Roller part # CE32100G that your referenced the distance from the mounting surface up to the top of the roller measures 3-5/8 inches. The roller part # CE32150G that you referenced instead measures 3-3/8 inches. Spool rollers such as # CE32150G do not have a weight rating. Usually you use more than one roller so the weight of the boat would be distributed a little more amongst all the rollers/bunks used so the amount of weight on any one roller would be less than the total weight of the boat.